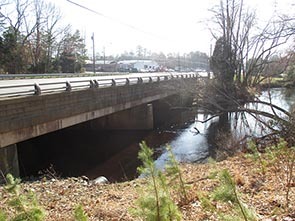 KMA was responsible for performing Concept Development studies for the replacement of this structurally deficient bridge. This was a regular scope project, and the studies included utilities investigations and coordination, public and agency involvement, alternatives development and evaluation, preliminary drainage design/stormwater management compliance assessment, and preparation of a CD report. In addition, KMA was retained to develop project base mapping (for CD studies and FD) through photogrammetric mapping methods.